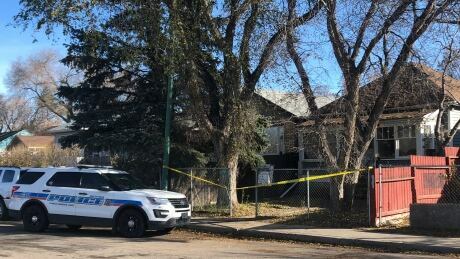 A 15-year-old boy has been charged with second-degree murder in connection to Regina's fifth homicide of 2018. Regina police officers were dispatched Sunday to a home on the 900 block of Cameron Street, according to a news release. Police, EMS and firefighters treated an injured 16-year-old girl there. She later died. Neighbour Patrick Young told CBC News he woke up about midnight and looked out his window. "It was just crowded over there. There was at least seven or eight cruisers and an ambulance." Dave Macdonald, who lives in the area, said at first the altercation didn't seem unusual. "I just heard a guy and a girl, louder and louder. I hear it every night," said Macdonald. "I went back to bed and then I noticed a flash and all of a sudden the whole house is lit up like a jack-o-lantern and there's cop cars everywhere." Macdonald said he "knew something was up" when people in white forensic suits arrived at the scene and began marking evidence. Officers detained people in the home and tracked down others who had left, the release said. Police identified a suspect after investigation. The accused boy, who cannot be named under the Youth Criminal Justice Act, was arrested Sunday. He appeared in court Monday. Police said the investigation is still underway and asked anyone with information to contact the Regina Police Service or Crime Stoppers.